Vespa in Italian, means wasp. I found these 2 beasts last Sunday while walking the steets of Paris. I liked the fact that the two bikes were the exact same model one yellow and the other red. 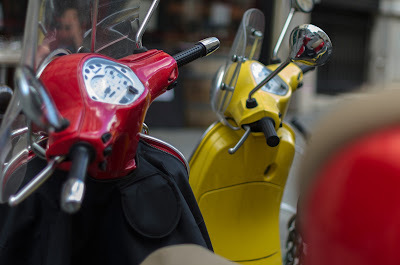 One can find the red scooter as a reflection in the rear-view mirror of the yellow one too. EXIF data available here.